Many people think of event managers as wedding or concert planners, but the field of event management involves much more than that. Guests may not notice the work of an event manager at a well-planned event, but they would notice the lack of planning at a chaotic one. At its most basic, event management is the process of using business management and organizational skills to envision, plan and execute social and business events. People who specialize in event management work with budgets, schedules, and vendors to create the best possible events for their clients. Many companies use event management firms to coordinate their most important meetings and other events. Event planners go by many different job titles, but the core function of their work all falls within the realm of event management. When you work in event management, you'll be involved in planning, executing and evaluating corporate, association, nonprofit, government, and social events. Event management requires strong organizational, budgeting and creative skills. An event manager will start planning an event by meeting with the client and collecting information about the client's vision of the event. She and the client will develop an event budget, and discuss the overall concept or theme. Once the budget is in place, the event manager will finalize the concept for the event, work to line up a location and vendors, and obtain any necessary permissions, permits, and insurance. If speakers are required for the event, the event management team will coordinate with the client to engage them. If other extras, such as parking and transportation, are needed, the team also will arrange for those. On the day of the event, the event management team will be on-site to run the event and handle any problems that arise. Following the event, the team will wrap up any remaining details and get feedback from the client. The job market for event managers is growing, with some estimates that the need for event managers will increase by one-third in the next decade. Most people entering event management will need a bachelor's degree. Experience in hospitality or tourism management also is helpful. A successful event manager is a true people person and has excellent organizational skills, interpersonal skills, and multitasking skills. Event management teams often work closely with public relations teams and with hospitality professionals at event locations. Some event management professionals travel frequently to handle clients in various locations, while others focus on managing events in one geographic area. 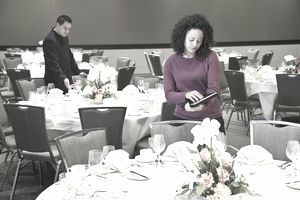 A planner's main responsibilities involve keeping track of time during your events, ensuring proper set up as established by the client, managing the wait staff, catering liaison, and other venue-related tasks that are pivotal to the success of the event. Event managers, on the other hand, are there with you every step of the way. Managers orchestrate all the event details, handle vendors, create and manage budgets and timelines, assist with contract negotiations, and manage the venue selection process.